In his Facebook post he begins with “It's almost a year. Despite placing priority on promises and trying to improve the country's economy, you are still busy sabotaging each other and try to build a flying car." 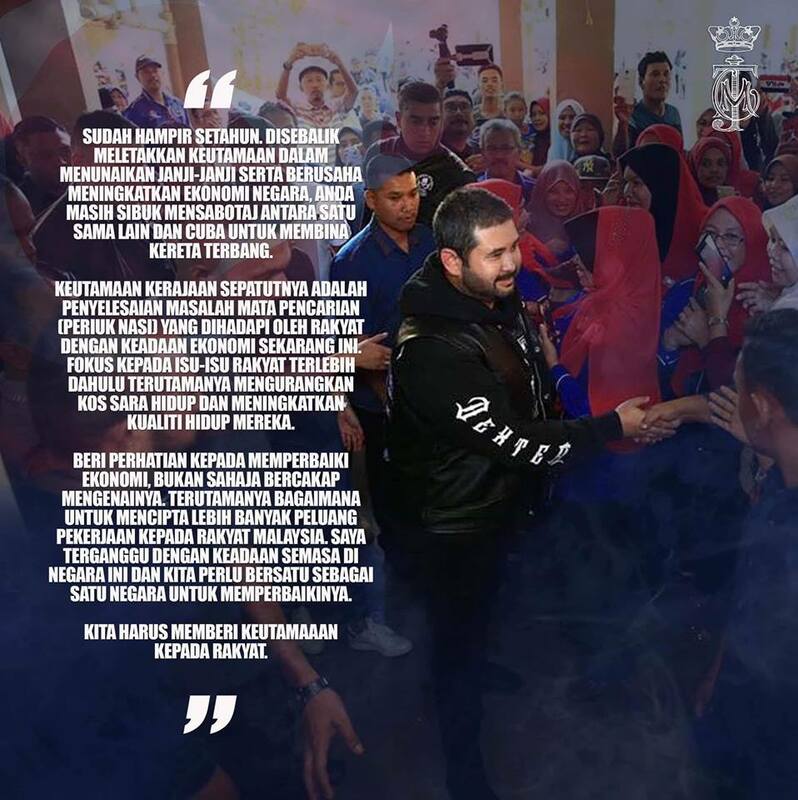 In a Facebook post dated Sunday, March 17, the Crown Prince of Johor, Tunku Ismail Ibni Sultan Ibrahim, appealed to the Pakatan Harapan (PH) government to stop ‘sabotaging each other,’ trying ‘to build a flying car,’ and to prioritise the needs of the people. Since the post went up, it has received 14,000 reactions and comments and it has been shared more than a thousand times. He then stated what the priority of the government should be: solving the problems of people’s livelihoods amidst Malaysia’s economic situation. He zeroed in on two main issues: reducing the cost of living and to improving their quality of life. He wrote that improving the economic situation, and not merely talking about it, in particular, creating more opportunities for employment for his countrymen. He expressed how concerned he is about Malaysia’s situation and said there is a need to unite as one country to address their problems. Though the Crown Prince did not specifically refer to any situation in his post, Johor has had to deal with the fallout from a serious chemical waste dumping that occurred on March 8. This resulted in around 2,700 people affected by the noxious fumes stemming from the illegal chemical dumping, with hundreds needing medical treatment, and several confined in hospitals’ intensive care units. This is not the first time this year that the Crown Prince has been critical of the PH government under Prime Minister Dr Tun Mahathir Mohamad. At the beginning of the year, he also appealed to the PH government to stop fighting amongst each other and to start actually governing in another Facebook post. He wrote, “I really want the government to be successful. I wake up every day hoping to be wrong. But, they keep proving me right. I did the same with the old government. And I’m doing the same now. No difference. Just wanting the best for the people. Some may not like what I say but that’s the challenge. To keep speaking up for the rakyat (people)who can’t. Let me be public enemy No.1 if I have to be. I’m consistent and stand by my principles. Please… Please start Governing. Please stop fighting amongst each other, Please stop politicizing every issue. Sometimes I get it wrong. Everyone makes mistakes. For the mistakes that I’ve made, I’m sorry. I think we all should reflect on 2018 and be sorry for the wrongs. Dr Mahathir was none too pleased with the Crown Prince’s words and said that Tunku Ismail needs to understand better the differences between issues under the state and federal governments.